Visitors can find a wealth of Aboriginal heritage throughout Trowana (Tasmania), especially along the coast. As with most things in Tasmania, the Aboriginal experience here is gentler than the experiences in mainland Australia. Keep your eyes open for shell middens along the coast, where Palawa (Aboriginal people) have been living for at least 40,000 years. Be respectful: View but don't touch or walk over the easily damaged middens. 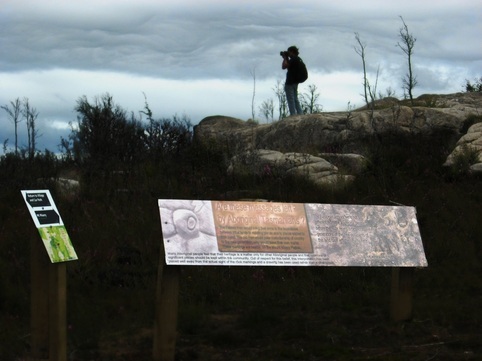 There are also several interpretive experiences in Southern Tasmania, designed to introduce visitors to Palawa heritage. Huon Valley Escapes acknowledges the Palawa as the traditional owners of Trowana and encourages visitors to learn a little of the history and culture. Aboriginal cultural stories are best understood by visiting the Country to which they relate. 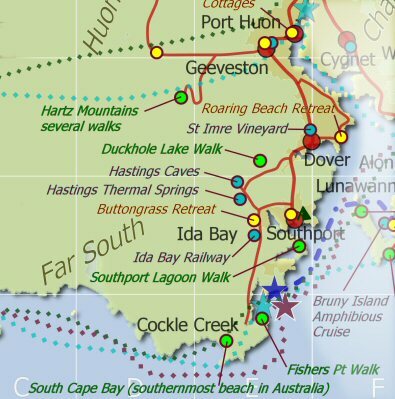 Here are a few of the many opportunities throughout Hobart and the Huon Trail. 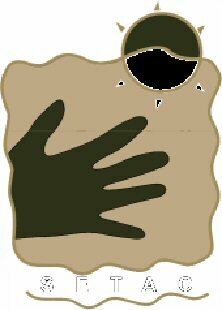 ​This is the Country of the Melukerdee band of the Palawa people. These are Aboriginal Tasmanians, the traditional and continuing custodians of this Country. They have taken care of this land for at least 37,000 years, many people say much longer. The responsibility to conserve and protect Country’s natural values is now one which is shared with all the people who call it a home or have other meaningful connection. Palawa is a name many Aboriginal Tasmanians now use to refer to themselves. It is a name used widely by Aboriginal groups in Tasmania at the time of the British invasion. 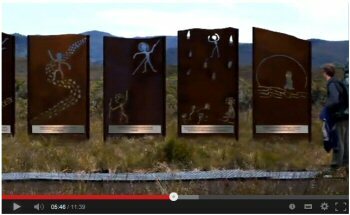 Tasmanian Dreaming stories tell that Palawa was the first human. Using Palawa as a name helps Aboriginal Tasmanians to maintain an enduring link with their cultural heritage and helps maintain an identity clearly distinct from that of other Tasmanians. In Aboriginal philosophy people do not, nor cannot ‘own’ Country. Instead, Country owns the people. The Palawa people see their role as custodians and caretakers of this Country: Truwana. 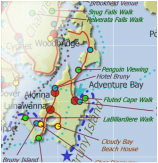 Melaleuca is either a 5 day walk from Scotts Peak, a 6 day walk from Cockle Creek or a 45 minute flight from Hobart. The Needwonee Walk is a half hour circuit, with some permanent and some temporary installations using both traditional and modern methods. Ten minutes walk from the end of the road at Coningham Nature Recreation Area takes you to a traditional coastal cave shelter. Please do not enter the cave. With respectful observation, it is possible to see layers of shells, bone fragments and charcoal. On the opposite side of the car park from the main lookout, is a wheelchair accessible walk to the western viewing platform and some interpretation of the Muwinina tribe heritage. 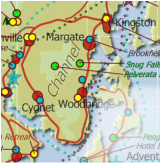 The centre is not a tourism centre but a resource and campaign centre for the community. The Tasmanian Aboriginal Community and supporters believe that the Care and Protection of Tasmanian Aboriginal Heritage and Culture is important. Tasmanian Aboriginal Heritage and Culture is alive and adds vibrancy to the greater state of Tasmania. Legislation is currently before the Tasmanian Parliament proposing reforms to the way Aboriginal heritage is managed. Watch the video (at right) then you can read background, hear audio interviews and get involved in the discussion. Three hours well made walking track. 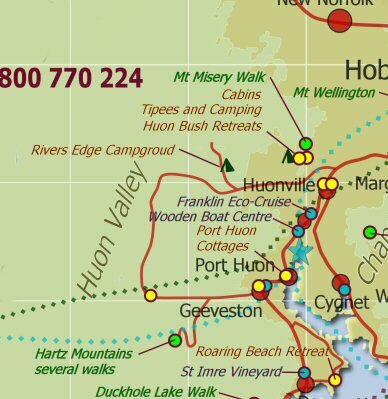 Begin at Huon Bush Retreats, travel through rainforest and sub-alpine heathland to the top of Mount Misery. Thirty interpretive panels discuss the differences and similarities of Aboriginal, early European and modern custodianship. 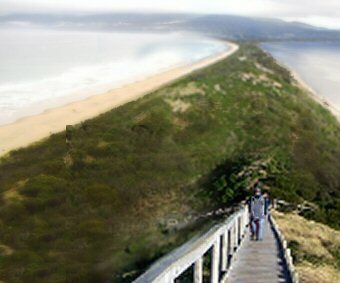 Climb the stairs to a spectacular lookout at Bruny Neck. Learn a little of the Nuennone band and the impacts of European arrival. A short walk along the clifftop through a garden of traditional plants. Interpretation explains the Aboriginal uses of various plant species.